As a trusted distributor for the industry's top brands, Arm-Tex provides premium-quality, precision, portable digital thermometers for specialty applications, explosive environments and rugged field use. 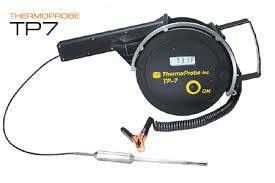 Created as an effective alternative to inaccurate glass thermometers, ThermoProbe temperature testing devices offer unique characteristics you won't see in standard electronic thermometers. These devices are also listed as intrinsically safe to North American, Japanese and European safety standards, making them valuable assets for organizations that demand the highest-performing products on the market today.